Ever since the beta plug-in came out for Make the Cut to cut directly to the eCraft, there have been a lot of eCraft users that are playing around with Make the Cut. Some of them are experienced Make the Cut users and others are new to it. I remember when I first started using Make the Cut, that it was maybe a little overwhelming because there is SO much that we can do with Make the Cut. I decided to put together a video here for us eCrafters on some of the basic and most common things that we can do now with Make the Cut. I have a few more videos in mind using Make the Cut, but if you have an idea of something that you would like to see, please leave a comment or send me an e-mail and I will do my best to make it happen! 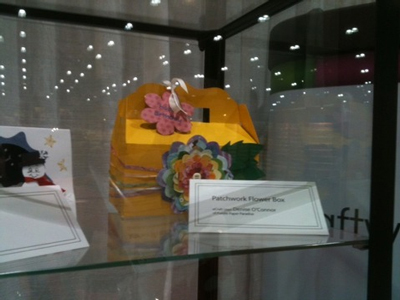 My Box is on display at Craftwell's CHA Booth! I'm really excited to share with you a project that I made for Craftwell to display at their booth at the CHA Winter 2011 Trade Show! The box is cut from the Handled Boxes collection at LetteringDelights.com. I cut it out of 12x24 paper at the largest possible size. The ribbons are some White Silk from PapertreyInk.com that I hand dyed with some Perfect Pearls mist sprays. The flower is made up of several layers of the Skinny Flower and Thick Flower from the Fundamentals 1 SD card. I patchworked the patterned papers in a rainbow effect and just kept layering. I am thinking about doing a video tutorial on how I made this, if you are interested in it, let me know so I can add it to my list. The tag at the top of the box was so super easy! I used the thick flower (in a shadow) using the eCraftshop Pro software and then layered my sentiment using a TTF (called Hey Gorgeous) directly on top of it and cut the whole thing out in one pass. I then just deleted the words and cut the base layer in cardstock to layer underneath it. The above photo is courtesy of Kim Bush from Cutters Creek who was at the booth yesterday and grabbed a picture of it on display! Thanks Kim!! Earlier today Andy at Make the Cut released a beta version of the eCraft plug-in. This means that for those of us that have purchased Make the Cut, we can now cut from Make the Cut directly to the eCraft. I have played around with it for a few hours, and so far so good! I have cut some things testing out the different features. I have been able to cut from the tray as well as from the front. I have also been able to draw with the pen. Andy has stated that he was cutting on a machine that had firmware version 2.0. I have firmware version 1.01 and no problems yet, so I think that is good news! Here is a quick video that I did to show you the plug in as well as the orientation of the screen to what you get cut out of the machine. Over the next few days I will be doing more with this, so there may be more videos on this. I just realized that I never shared this picture with all of you. This is the Christmas card that I made for 2010, and I just adore it! I got so many compliments on it! The frog image is from Dustin Pike and I printed him out and colored him with my Copics. The blue for the snowglobe was done with Airbrushing. For the snow, I used some white Liquid Applique. This is a Joy Fold card so on the inside are pictures of my kiddos and a little message from our family. The snowflakes were cut using Spellbinders and American Crafts glitter paper (love it!). 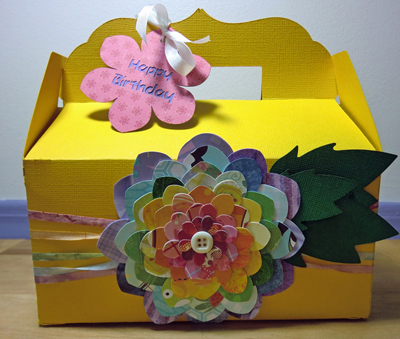 The patterned papers are from the Color Couture line at Papertrey Ink and the cardstock is also PTI color Berry Sorbet. I hope everybody has a great Friday! I am so sorry that I haven't posted for quite awhile. My family and I just got back from a fabulous Disney World vacation. Remember all those Disney sweatshirts that I made with T-shirt vinyl, they got used on this trip. There were a couple of days where we needed them all day, but most days we just wore them in the morning and the evening. Disney World is hardly a relaxing vacation, but our family really needed to just have fun together. My husband did really well on the trip. If you remember, he had back surgery in October and (although a couple of days he rented an ECV to make it a little easier). It sure is good to be home! I have been doing quite a bit of crafting lately and I will be sharing some more of my creations with all of you. My eCraft has gotten a good workout! The project that I am sharing with you today came as a request from a follower to show more of what can be done with the Fundamentals 1 card that comes with the eCraft. One thing that I love to do is look at shapes and try to envision a way to use them that is other than what the shape was intended for. Here is a video showing how I made this flower. I hope you enjoy it! In yesterday's post, I shared a video on how I find the pressure settings for a piece of cardstock and today I thought I would share with you how I go about finding the pressure settings for a piece of lighter weight paper. This works for things like copy paper, vellum, and any other non-cardstock weight papers. The process is pretty similar to the cardstock method, just with a different starting point. The Cardstock Stabilizer - I have been contacted by some people that have been kind of upset that some papers need to have the cardstock stabilizer. I have to be honest here...I don't really understand why anyone would be upset about it. It is not at all like using a mat because it is not sticky, there is no peeling images on and off the mat risking that they are going to get torn up. 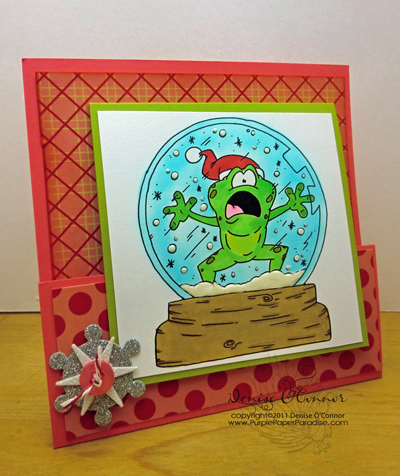 The cardstock stabilizer doesn't get ruined in the process of doing this so therefore it can be used several times over. The only time that I have ever had to replace my cardstock stabilizer is when I accidentally had my pressure too high and it cut all the way through the cutting paper and the stabilizer. 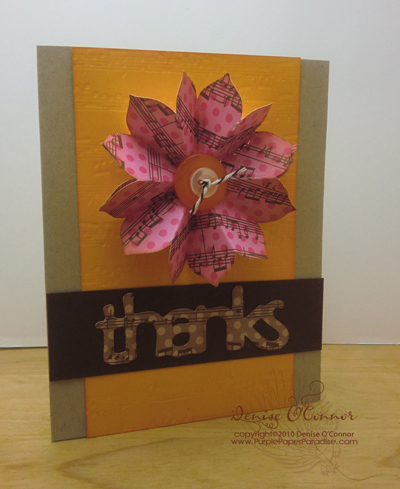 There is also a huge advantage to using the cardstock stabilizer and that is NO TABS!! Love That! I know of several users that always cut with the stabilizer because of that! If you are skeptical of it, I can understand that, but do give it a try because it really is a great thing! Learning the Machine - Just like any die cutting machine, the eCraft has a learning process to it. I was asked by someone if I have to do these test cuts before each new project and the answer is No. As you get more and more familiar with the machine, you kind of develop a "sense" about it. I am at the point now where I can pick up a piece of paper and I have a pretty good idea of what pressure my machine should be at to cut it. I am usually only off by a 1/2 step. As you get more and more familiar with your machine, you too will develop this "sense" for it. The videos I have done here are to give you an idea of how I have learned my eCraft so that you can learn yours. The eCraft Settings Chart is also a great source to learn where to start with a certain paper. When I first got my Cricut Expression, I can tell you that I had a lot of trouble figuring out that machine. There was one day in particular that I clearly remember because I came really close to just chucking that machine out of the window! Just ask my husband, he actually packed up the kids and took them out for awhile so they didn't have to see Mommy so upset. Eventually I learned the Cricut and figured it out, got a lot of help from bloggers and You Tube videos. I gradually got more and more comfortable with it and now I know exactly what I need to do to get the machine to do what I want it to. It can be frustrating to learn a new machine, but it is worth the frustration in the long run, so don't give up! With the holidays behind us, I finally have some time to do a couple of videos that I have been planning on for awhile now. So in honor of the New Year, let's get that eCraft cutting! For this first video, I am going to share with all of you how I go about finding the pressure settings for a piece of cardstock. I have seen a few newer eCraft owners online getting frustrated because they can't seem to find the right setting and it really isn't difficult at all, so I thought I would share with all of you my process and a few tips and tricks that I have picked up. RULE #1 - If your paper is tearing, that means the pressure is too high! If it is not cutting all the way through, that means that the pressure is too low! RULE #2 - Check your blade and blade safety cap for debris that may be interferring with the cut. This has happened to me numerous times! RULE #3 - Make sure you are loading the paper in the machine so that the grain is going into the machine. Watch the video, because I show you exactly what I mean! RULE #4 - Weather and other environmental aspects do affect the settings, so if it has been awhile since you cut a certain type of paper, you may want to get in the habit of doing a small test cut before embarking on a large project just to make sure that your environment hasn't changed enough to affect the settings. I had a piece of paper that I tried to cut in the summer that I could not get to cut right at all. Fast forward to late fall/early winter and suddenly I could cut this paper and it cut great! Don't forget that you can download the eCraft settings chart (link located in the column to the right). Also, I am looking for some input so that I can keep this chart updated, please e-mail me any pressure settings that you find so that I can add them to the list. Thanks for watching and if you have any video requests for me, please let me know. I have a few more planned including some that were suggested so if there is something you want to see, I will do what I can to make it happen for you! Have a great day AND a GREAT YEAR!